Dr M’s mission to discover the best plant ID aids continues, and recently stumbled upon (for that is how the internet often works!) 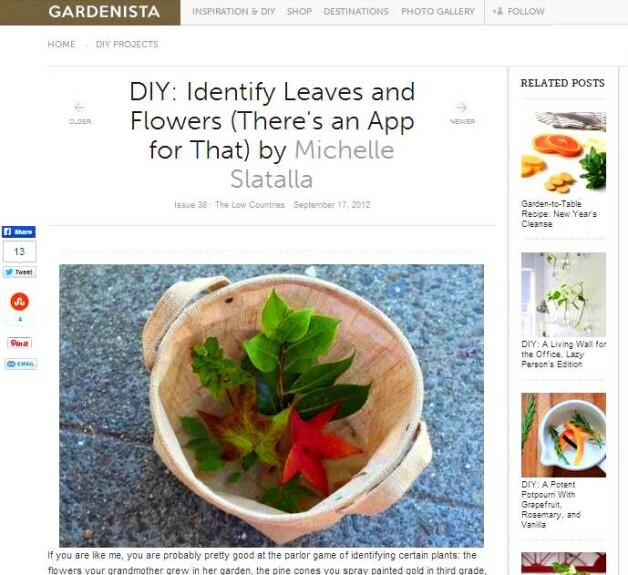 a nice post by Michelle Slatella on the US Gardenista website reviewing apps for plant ID. As Michelle notes, there are now botanical apps which aim to help people identify plants – Michelle says there are “zillions” but I think that is an overestimate! She mentions amongst these “zillions”, electronic field guides such Leafsnap, NatureGate, iPflanzen and Google Goggles. To see how well the apps work, Michelle spent a day with her daughters playing CSI: Plant Detective! Michelle went outside with her daughters to collect leaves and flowers from different species in the garden, then they downloaded four free plant identification apps and tested them on the bucket of plants they had gathered. How did they do? Well you can read what they learned here. Dr M says: Leafsnap seems to have a rather effective algorithm for identifying species from the leaf shape and so Leafsnap is a good way to confirm your identifications. But there is only limited botanical learning potential to be gained from just photographing a leaf! Dr M adds: Leafsnap includes a wide range of species from the Eastern US and the this is apparently set to grow (see full list here). Dr M notes: As yet Leafsnap has not yet been developed for UK species specifically and although it can be good for planted exotic species in the UK, there is currently only limited scope for using it to identify UK native trees. Dr M says watch this space for a guest blog post reviewing Leafsnap and other plant ID apps. Hmm, I saw this too and wondered about covering it on the BSBI Blog, but as you point out, it isn’t all that helpful for British & Irish botanists. BSBI has been offered a couple of European apps to trial and I’m sure we will see a really helpful app in the next year or so, but for now I don’t think you can beat going out in the field with a handlens, the Veg Key, the Book of Stace (Baby Stace best, to avoid back-ache) and a bunch of friendly botanists to help you ID plants the old-fashioned way! The Leafsnap concept sounds interesting even if this particular implementation is geared towards US tree species; I reckon it could be useful just by overcoming the recurring difficulty of deciding precisely what shape a particular leaf is! Two immediate comments however: it gets a very lowly 2-star review on Apple iStore due largely it seems to bugginess; secondly, 50 Mb is pretty big for a possibly useless iPhone app. That said, I use “TreeId” by Isoperia a lot. It costs £2.29 and it is seriously big (85 Mb), but it is rated at 4.5-stars. They also do a quite nice OrchidId app. As Dr M is aware, I secretly yearn for the day when I can point my phone at a plant while it sniffs the DNA and immediately tells me what it is. Did I just say that out loud?